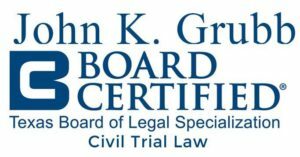 Family law attorney John K. Grubb is board certified in Civil Trial Law by the Texas Board of Legal Specialization with an MBA in accounting and finance. 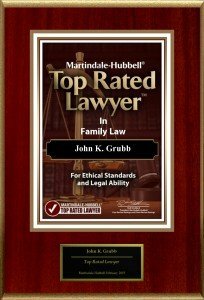 John K. Grubb has received a number of accolades over his 30-plus year career, including the Martindale-Hubbell highest possible “AV” rating for both legal ability and ethical standards. John K. Grubb also has been rated as one of Houston’s Top Lawyers by H Texas Magazine since 2012. Our firm extends the right combination of skill, effort, strategy and wisdom to offer clients the best outcome possible in their divorce or family law case. Cases, where one or both spouses own a business, require a unique attorney. Clients need a lawyer who can be aggressive, but wise enough not to do things that may damage the business. The lawyer must understand the nature of the business and must work closely with accountants, tax specialists and business valuation experts to craft a settlement or an award that fits the particular case. John K. Grubb has been representing clients with significant business and corporate assets for over 30 years. He has a Bachelor’s degree in Business Administration and a Master of Business Administration. In cases involving minor children, child custody is the most important issue in divorce. Parents are understandably anxious as to post-divorce life regarding the well-being and custody of children. John K. Grubb has been guiding mothers and fathers through the divorce process to help them do the best they can for their children in their new lives moving forward. Although statutes govern Texas child support calculations, there are intricate nuances that less experienced attorneys frequently miss. This is particularly true for high-income parents. Once an order has been entered, it can be difficult to modify child support. Ensure the calculation is done right for the benefit of yourself and your children. Hire a lawyer with a history of representing high earners in child support cases. Many times prospective spouses have substantial assets, children from other marriages, partnership or business agreements. They may then wish to enter into a Premarital Agreement defining the respective rights and obligations of each party. Post-marital agreements are frequently needed when spouses enter into business contracts and equity partnerships after marriage. John K. Grubb is a seasoned Houston prenuptial agreement attorney for drafting and enforcing premarital and post-marital agreements for business professionals. Trial Attorney – Getting Divorced in Texas and Need Professional Legal Counsel? Let our attorney’s years of experience in family law, business, and finance guide you through the divorce process. John K. Grubb can provide you the skill, effort, strategy, and wisdom needed to get you through a divorce. John K. Grubb offers empathy and professional counsel to better serve families during difficult times. Get started now by filling out our online divorce form to have someone from our office contact you. Alternatively, you can call us directly at (713) 877-8800. Family law attorney in Houston TX handling divorce cases in Harris County, Fort Bend County, Brazoria County, and Montgomery County. As a matrimonial and prenup lawyer, he assists residents inside the 610 Loop in addition to clients living in the Katy, Sugar Land and Spring Cypress. If you live in Conroe, Richmond, Cinco Ranch, Tanglewood, Memorial, Medical Center, Galleria, River Oaks, West University or Energy Corridor, our experienced West and Northwest Houston attorney John K. Grubb wants to help you find solutions to your divorce problems.